• Painless lymph node enlargement (most often the cervical nodes). 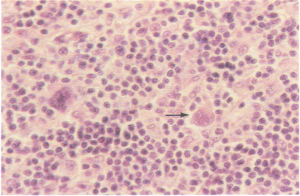 The majority of patients present with lymph node enlargement; the latter however in itself does not imply the diagnosis oflymphoma. 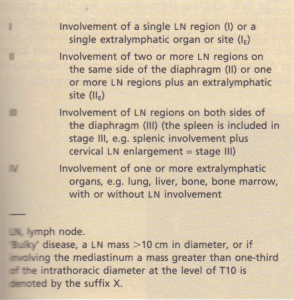 The differential diagnosis of cervical lymph node enlargement is shown. • ‘B’ symptoms: fever, drenching night sweats, weight loss of> 10% body weight. • Other constitutional symptoms, e.g. pruritus, fatigue, anorexia and alcohol-induced pain at the site of enlarged lymph nodes. • Symptoms due to involvement of other organs, e.g. lung, bone, liver. 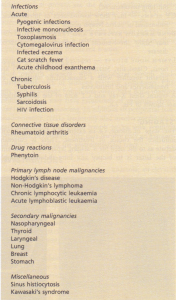 Differential diagnosis of cervical lymph node enlargement. LYMPH NODE BIOPSY – required for a definitive diagnosis. 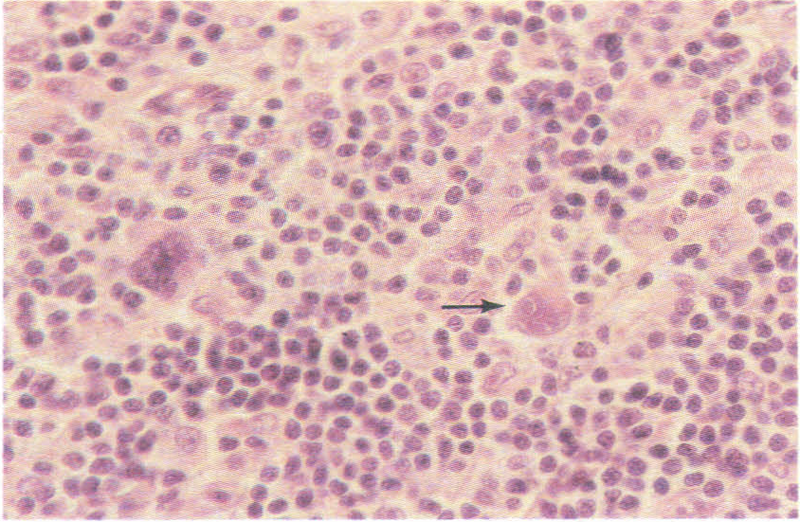 Classically, Sternberg-Reed cells are present together with a characteristic admixture of lymphocytes and histiocytes A typical chest X-ray and CT scan of the same patient are shown. The ‘stage’ of disease, i.e. its extent and distribution, will influence the choice of treatment. There is currently debate as to the need for a ‘staging laparotomy’. The aim of the latter is to biopsy any intra-abdominal lymph nodes which appear enlarged and to perform a splenectomy, the spleen being notoriously difficult to demonstrate as being involved with lymphoma by any radiological technique. 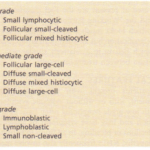 The original Ann Arbor staging classification has been modified (see Table 7.12) to take into account the volume of lymph node masses and the use of modern imaging techniques such as CT scanning. 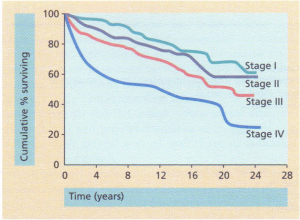 The long-term outcome is closely related to stage. The majority of patients are treated with radiotherapy, provided that all the involved sites can be encompassed within a radiation field. Patients with a large ‘bulky’ mediastinal mass are usually given chemotherapy initially, since otherwise too much lung tissue would be irradiated with potential long-term lung damage. Such patients receive radiotherapy subsequently. Most patients are treated with chemotherapy in the first instance, with subsequent radiotherapy to sites of ‘bulky’ disease to prevent local recurrence. (In practice, the latter applies mainly to patients with a large mediastinal mass at presentation as above.) The first effective chemotherapy for HD, a regimen comprising mustine, vincristine (oncovin), procarbazine and prednisolone (MOPP) was used until recently, when the combination ABVD (doxorubicin (previously known as Adriamycin), bleomycin, vinblastine and dacarbazine) was developed and added to MOPP, as alternating cycles. Apart from the immediate side-effects of nausea, vomiting and hair loss, potential long-term side-effects, namely infertility and second malignancy, have caused concern. Current ‘MOPP-EVA’ so-called ‘HYBRID’ treatment programmes have therefore been designed to minimize these long-term effects, by reducing the amount of alkylating agent and adding drugs such as doxorubicin. The emphasis has been on using alternating, non-crossresistant drug combinations, given as cycles of treatment, e.g. every 4 weeks for about 6 months. Treatment can usually be given on an outpatient basis and most people are able to lead a normal life. The prognosis correlates closely with stage. However, survival of patients in whom recurrence occurs is inferior to that of those who remain in continuous remission. 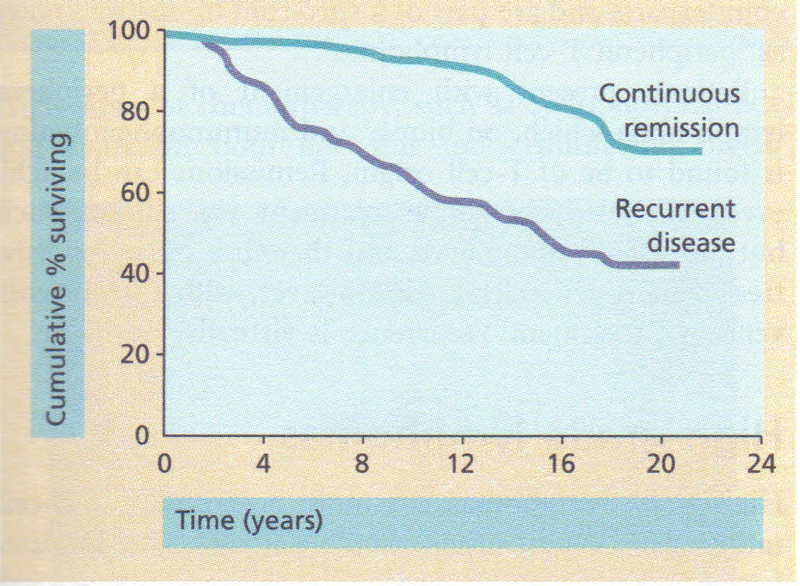 Failure to achieve an initial complete or almost complete response and early recurrence (within 1 year of remission being achieved) are both associated with a very poor prognosis. 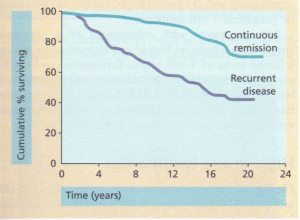 Similarly, patients who develop recurrent HD more than once will almost certainly die of HD eventually. 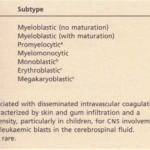 Hence, the use of myeloablative therapy with autologous bone marrow or peripheral blood progenitor cell support in these situations (see p.371). In contrast, patients who develop recurrent HD, e.g, within the abdomen, a few years after receiving radiotherapy for localized, supradiaphragmatic disease can be given combination chemotherapy, still with curative intent. 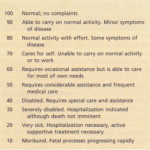 Survival courses of patients with Hodgkin’s disease.